I love my Buddha bowls. They not only look great but are easy to hold and quite stylish. Makes tea and soup times extra special. I bought one for my daughter for Christmas . I bought this because I have a lot of pain my hands and my grip is failing. It fits nicely in my hands but you need to be careful it using extremely hot liquid because the bowl gets hot. It feels so comfortable in my hands. I actually bought 2 and my husband loves his, too. This item was a gift. And the thumb holds are fantastic as well as the ample space for a meal. Very pleased with outcome. These bowls are gr8 for soup, hot chocolate, coffee or anything you like to serve in a bowl. 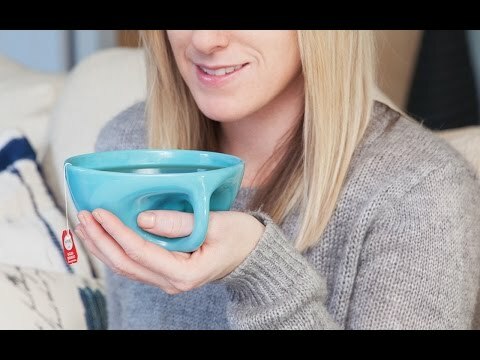 Keeps hands warm during cold spells and I always like to drink soup instead of using a spoon. For some reason a spoon and I don't work well together but these bowls and I work gr8 together. Love the colors as well!